Açotubo Group developed the Integrated Solutions Center, a complete structure to guarantee your ease at any time. Industrial process of material adequacy to be commercialized, in the measurements specified by the client. 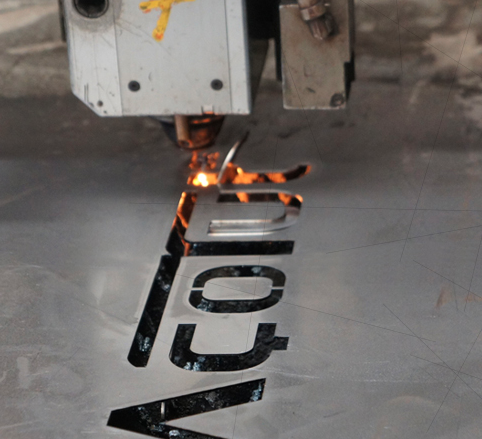 Laser thermal cutting of decimal accuracy and excellent finish for plates and tubes. 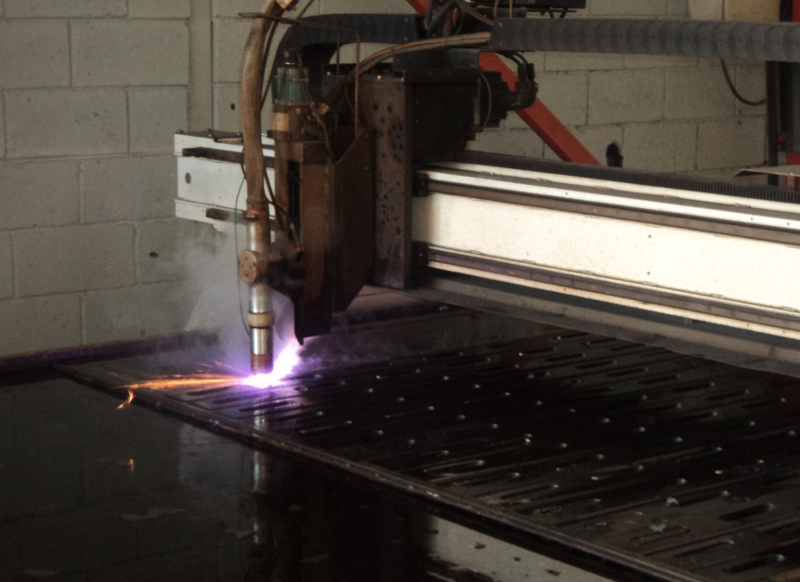 Plasma thermal cutting for plates and tubes with thickness over 6,35 mm with no need of decimal accuracy. Process of plates blanking both crosswise and lengthwise. Destructive tests obtained from de a specimen extracted from the material in use, which will be forwarded to a qualified laboratory for the respective tests. • Tensile tests: it aims at evaluating the limits of the material mechanical resistance (burst). • Mechanical tests: it evaluates the set of mechanical properties that will define the values regarding its resistance, in function of the limits imposed on the project to be executed. • Impact test (Charpy): They are tests performed at a wide range of temperatures, aiming at determining the material brittle and useful transition temperature. Non-destructive type of test. It consists in the application of a known load through a driller of known geometry and in the drilling depth measurement. This hardness level can be converted into several classes and standard scales, according to the specification previewed in each project. Process used for the removal of oxides and inorganic impurities, including in these categories: annealing and rolling mill scale, rust layers, etc. ; In this process (contrary to the pickling one), its removal is performed by contact frictions, and it can be through steel grit or abrasive oxides micro-grains. 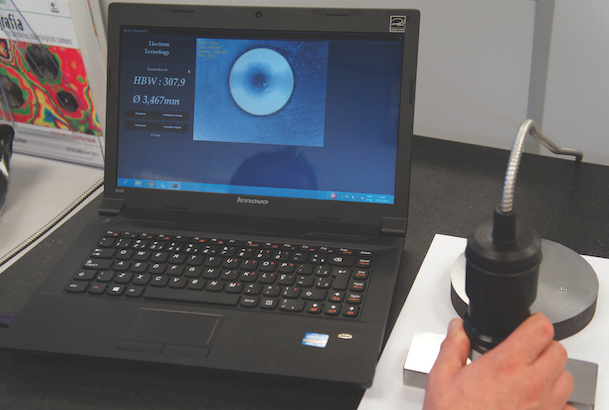 The Penetrating Liquid (LP) test is a non-destructive test method (END) used only to detect discontinuities that are open to the surface such as cracks, bends, pores, etc. This method is of simple application, requiring from the analytical inspector, verification of applicable rules in this test. Thermal treatment characterized for removing strains due to the forging and mechanical conformation processes, aiming at adjusting its grain size, obtaining as a result a thinner structure; its cooling is uniform to the air, without restricting or accelerating it, to room temperature. The non-destructive test by Magnetic Particles (PM) or Magnetic Particle Testing (MPT), constituted in a non-destructive type of tests, that derives from the production of homogeneous magnetic fields in form of magnetic type flowlines in ferromagnetic materials; it is intended to detect the verification of eventual internal imperfections, derived from the treatment and machining processes. External anti-corrosive protection of steel tubes, overhead (humid or dry environments) or coastal and industrial environments. It is intended to: conduction of gas, oil, water, ore, among others. Applied on the hardened steel, immediately after the hardening, resulting in modification in the obtained structure; This structural alteration results in ductility improvement, that is, besides lessening or removing the internal strains, the steel acquires better machinability conditions. It is the steel most important thermal treatment, especially to the ones used in mechanical construction; this process promotes such intense structural modifications in the steel, that they end up resulting in a great growth in its hardness, resistance to wear and to traction, at the same time its properties related to the ductility reduce, resulting in internal strains (structural and thermal) at great intensity. They are required for correction of these troubles, a later process called tempering. Annealing of the subcritical type, intended to remove internal strains without fundamental modification of the existing properties, performed after the cold deformation, thermal treatment, welding, machining, etc. Chamfer performed in extremities of tubes intended to the operation of application rules (API 5L or ASME B16.25). Polishing is a process of abrasion machining after mandreling, turning, milling, internal grinding, etc., providing a precise drill geometry and good superficial finish. Pickling is all the process intended to remove oxides and cleaning of inorganic impurities, of categories such as: annealing and rolling mill scales, rust layers, shells derived from forging, superficial encrustation , besides dust and further residues derived from industrial processes. The same as the pickling process, adding to the material surface a thin layer of protective oil, inhibiting it from the oxidation process or rust precipitation. 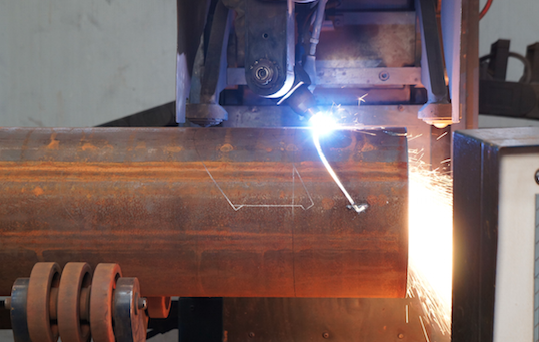 Operation of material removal from the hot rolled bar surface, intended to obtain a better finish or, to remove eventual layer of superficial decarburization. In this process, there will not be alterations in the hot rolled product mechanical characteristics. This mechanical process is intended to execute the alignment on the material surface without damaging it, that is, to guarantee its rectilinearity, within the allowed dimensional tolerance class; In general, they are applicable in materials that were submitted to thermal treatment of any nature. 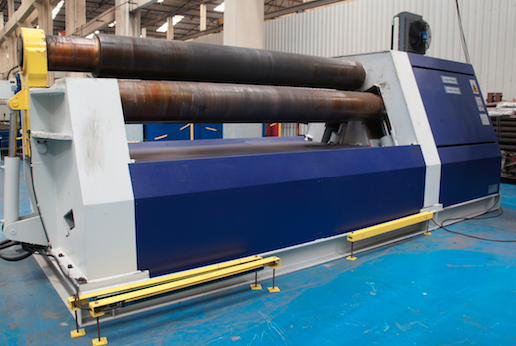 Machining mechanical process through abrasion (abrasive cylinders), intended to improve the finish requirements, inclusively regarding the material visual aspects. Its main objective has as a consequence to remove strains due to the forging and mechanical conformation processes, hot or cold, reducing the steel hardness and improving its ductility, besides adjusting the grain size, producing a defined structure, removing the defects caused by mechanical deformation or thermal treatments the material has been submitted to. It is about obtaining the final gauge through cylinders (abrasive) action, after a pre-calibration of the rolled bar(via drawing or peeling), aiming at the removal of circular run out, avoiding damage to the processed material and to the equipment. The benefits of this process result in a better quality of superficial finish and stricter dimensional tolerances. 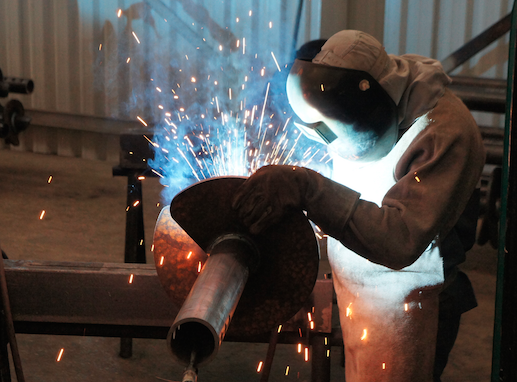 The same as the hardening and tempering process, using processes with atmosphere whose composition is controlled. It consists in the tractioning of the steel bar in a die (die for wire drawing) with reduction of the section, obtaining the gauge and the desired finish. This process is performed cold and it gives the material, through the grains coiling phenomenon, mechanical characteristics that facilitate later manufacture and performance processes of the final part. Process of deep drilling and steel bars and tube machining, that consists in trepanning the bar with the good use of its core, avoiding it from transforming into splinters the area to be drilled. 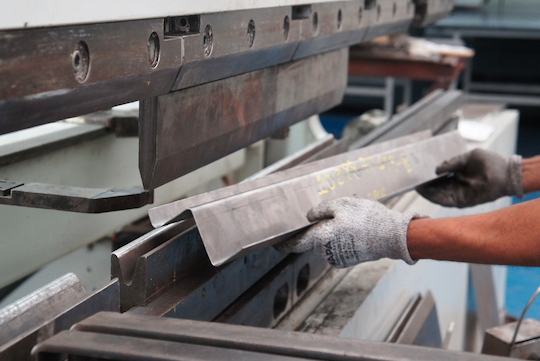 Since this process has special manufacturing techniques, allowance limits (pre-established) for the metal must be observed, as a result of the stages that precede the trepanning, the material is submitted to surfaces preparation and cleaning. They can be supplied either raw or machined, inclusively by drawings and technical specifications provided. The main purpose of the ultrasound test is the detection of internal discontinuities in ferrous and non-ferrous metallic and non-metallic materials, through the introduction of a sonic beam with characteristics compatible with the material structure to be tested. This sonic beam, once introduced in a favorable direction in relation to the discontinuity (interface), will reflect this discontinuity and will show on the screen of the device being used, peaks of this imperfection (echo). Some superficial discontinuities can also be detected through this non-destructive type of test. Hardness test (HB)Non-destructive type of test. It consists in the application of a known load through a driller of known geometry and in the drilling depth measurement. This hardness level can be converted into several classes and standard scales, according to the specification previewed in each project.GalvanizingOThe galvanizing process is an electrolytic process, that consists in coating surfaces of metallic parts through the application of other metals, let’s say nobler; This process is intended to protect a part against corrosions, besides giving it better finish conditions, whether esthetic or decorative.Electrolytic galvanizing processElectrolytic galvanizing process consists in a deposition of Zinc alloys on a basis material, through electrical current. That is, through this current supplied by distribution chains transformed from alternate to continuous (using grinders), so that it can occur this separation of the current in two parts, the positive and negative ones (Anode and Cathode). On Anode we will apply Zinc, which in turn will dilute itself in an electrolytic solution, being conducted till the tube that will be in contact with the Cathode. Due to the high current applied (around 2.000 A), this Zinc is deposited on this surface, remaining there, even under severe conditions of bends and twists, eventually applied on this tube.BlastingProcess used for the removal of oxides and inorganic impurities, including in these categories: annealing and rolling mill scale, rust layers, etc. ; In this process (contrary to the pickling one), its removal is performed by contact frictions, and it can be through steel grit or abrasive oxides micro-grains.NormalizationThermal treatment characterized for removing strains due to the forging and mechanical conformation processes, aiming at adjusting its grain size, obtaining as a result a thinner structure; its cooling is uniform to the air, without restricting or accelerating it, to room temperature.Magnetic ParticlesThe non-destructive test by Magnetic Particles (PM) or Magnetic Particle Testing (MPT), constituted in a non-destructive type of tests, that derives from the production of homogeneous magnetic fields in form of magnetic type flowlines in ferromagnetic materials; it is intended to detect the verification of eventual internal imperfections, derived from the treatment and machining processes.Epoxy PaintExternal anti-corrosive protection of steel tubes, overhead (humid or dry environments) or coastal and industrial environments. It is intended to: conduction of gas, oil, water, ore, among others.Polyethylene CoatingExternal anti-corrosive protection of steel tubes, underground (humid or dry environments) or underwater (fresh or salt water) piping. Conduction of gas, oil, ore, water and others. Operation temperature: 40°C to 65°C (low density), 40°C to 70°C (medium density) and 40°C to 80°C (high density).BSP-type ThreadThe BSP-type Thread, are executed in tubes advisable to conduction of water for commercial, industrial, home, hydrants and sprinklers (fire drill) use, oil or liquid fuels, natural gas, LPG and compressed air.NPT-type ThreadThe NPT-type Thread, are used in tubes intended to the conduction of water for medium and high pressure industrial installations, steam installation, natural gas and LPG (distribution pipes and LPG centers), compressed air, oil refineries, oil or liquid fuels.Bung InsertManual process of putting plastic bungs in tubes, aiming to protect the performed threads in their extremities or to ensure its internal protection against dust, liquid in general (such as water, chemical products, oil, etc.). Advisable for stocks and in the materials transportation.DrawingIt consists in the tractioning of the steel bar in a die (die for wire drawing) with reduction of the section, obtaining the gauge and the desired finish. This process is performed cold and it gives the material, through the grains coiling phenomenon, mechanical characteristics that facilitate later manufacture and performance processes of the final part.UltrasoundThe main purpose of the ultrasound test is the detection of internal discontinuities in ferrous and non-ferrous metallic and non-metallic materials, through the introduction of a sonic beam with characteristics compatible with the material structure to be tested. This sonic beam, once introduced in a favorable direction in relation to the discontinuity (interface), will reflect this discontinuity and will show on the screen of the device being used, peaks of this imperfection (echo). Some superficial discontinuities can also be detected through this non-destructive type of test. Protective film applicationPVC film application on the plate face to protect it from risks and damage.BlankingProcess of plate cold cutting in the dimension the client needs.Laser CuttingLaser thermal cutting of decimal accuracy and excellent finish for plates and tubes.Plasma cuttingPlasma thermal cutting for plates and tubes with thickness over 6,35 mm with no need of decimal accuracy.Corte Transversal/LongitudinalProcesso de blanqueamento de chapas nos sentidos longitudinais e transversais.Crosswise/Lengthwise CuttingProcess of plates blanking both crosswise and lengthwise.PolishingMachining mechanical process through abrasion (abrasive cylinders), intended to improve the finish requirements, inclusively regarding the material visual aspects. Looking technical information in Integrated Solutions?